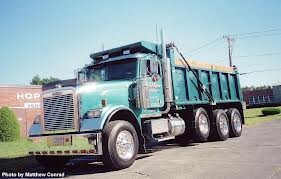 The united states first started to use large dump trucks during world war two. They would use them to move people, supplies, and equipment around the battle zone. They also used dump trucks to build roads for troops and other military vehicles. Freightliner never made a heavy duty dump truck til 1992 when they took their coronado that was a mid size dump truck and extended the frame and box and put a cummins engine in it instead of the old detroit engine. With the cummins engine it got 100 more horsepower then the old one. 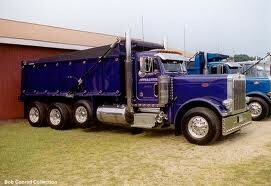 Kenworth makes a heavy duty dump truck but it is not as powerful as the other companies trucks. Kenworth uses the paccar MX engine which has a max horsepower of 485. This engine is more fuel efficient but do to its lack of power the box on the truck is only 18 feet long. But if you want a more powerful engine you will have to put a different one in yourself. 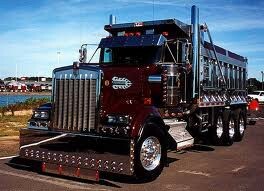 Peterbilt has always been a powerful truck maker. They have always used cummins engines that have a max horsepower of 600. These trucks come with box sizes from 18 ft to 22ft. Most of these trucks come with one or two sets of pusher tags to help the truck get more grip with heavy loads. They also help take stress off of the frame of the truck.